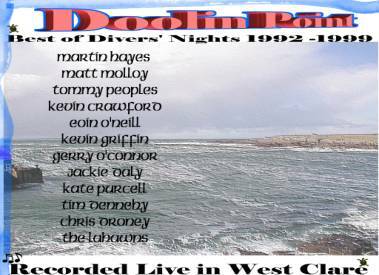 Doolin Point - The Best of Divers’ Nights 1992 – 1999 is a new live CD which will be released on June 15th. It contains the best of Divers’ Nights, a series of concerts held between 1992 and 2000 in North Clare. Clare is the home of traditional Irish music and North Clare is the home of music in Clare. Doolin Point is the best of the twenty hours of live traditional music coming from this corner of Ireland. This CD contains music from Martin Hayes (1994), Matt Molloy (1992 and 1997), Kevin Crawford (1993), Tommy Peoples (1992), Kate Purcell (1997), Tim Dennehy (1997), Jackie Daly (1992), Kevin Griffin and Eoin O’Neill (1994), Chris Droney (1992), The Lahawns (1999) and Gerry (Banjo) O’Connor with Kevin Doherty (1998). The concerts were presented by the Burren Sub Aqua Club, which managed to get the many of the pivotal figures in Irish traditional music to play at annual concerts in Ennistymon and Liscannor: Junior Crehan, PJ Crotty, Matt Molloy, Miko Russell, James Cullinane, Paul Brock, Davy Spillane, Begley and Cooney, Martin Hayes, Chris Droney, Jackie Daly, Manus McGuire, Sean Tyrell and Dordan to name just some of them. The complete track listing is below. For radio play, tracks 1, 2, 4, 5, 6 and 9 are particularly recommended.